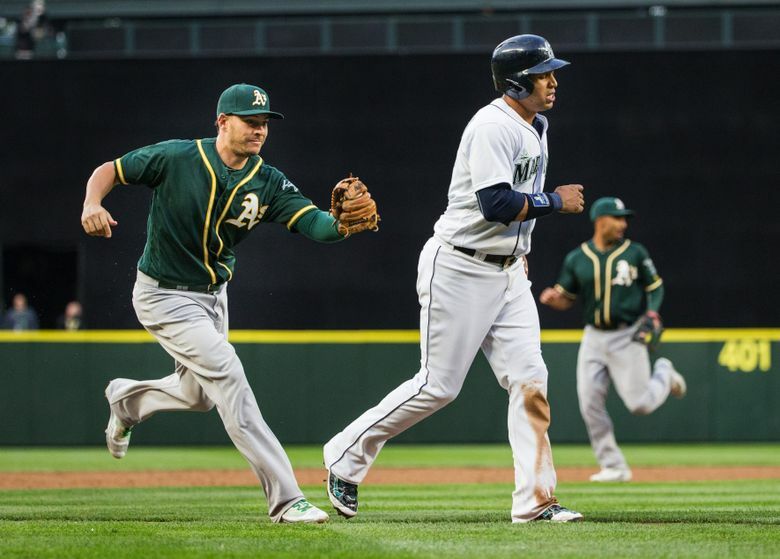 In need of another right-handed hitter in the lineup, the Mariners acquired veteran first baseman/outfielder Danny Valencia in a trade with the A's. Seattle sent pitching prospect Paul Blackburn to Oakland to complete the deal. Searching for lineup balance to complement a slew of left-handed hitters, the Mariners made a trade to address that need on Saturday afternoon. Seattle acquired right-handed hitting first baseman/outfielder Danny Valencia from the Oakland A’s in exchange for minor league pitching prospect Paul Blackburn. Valencia, 32, hit .287 (135-for-471) with a .792 on-base plus slugging percentage, 22 doubles, a triple, 17 home runs, 51 RBI and a .346 on-base percentage in 130 games with Oakland this season. He was particularly effective against left-handed pitching, hitting .318 (41-for-129) with seven doubles, seven homers, 19 RBI and a .924 OPS. After his stint with the A’s, Valencia was excited for a new opportunity. The chance to hit behind the trio of Robinson Cano, Nelson Cruz and Kyle Seager was also quite intriguing. “That’s a great group of hitters and I feel like I can extend that a little more,” he said. In conversations with Dipoto and Servais, Valencia was told that the bulk of his playing time will come at first base with some time in right field. But he can also play left field and third base. That versatility will allow him to be more than just a straight platoon player. With rookie Dan Vogelbach likely to see time at first base in his first big league season, Valencia also provides some every-day insurance if the young prospect struggles. It will allow Valencia to get at-bats against right-handed pitching. He’s pushed hard in recent seasons not to be limited to a platoon role. With the signing of Valencia, it means that the Mariners will not pursue another year with free agent first baseman Dae-Ho Lee. “There’s very little likelihood that both could fit on a same roster,” he said. There is some question about Valencia’s defense at first base. He’s started just 43 games there in the big leagues. Valencia, who said he played a season of first base at University of Miami when Ryan Braun played third, wasn’t concerned. He plans to work on first base this offseason in Florida with friends Eric Hosmer and Yonder Alonso — both excellent defensive first basemen. “I have some experience there,” he said. In seven big leagues seasons with six different teams, Valencia has hit .271 (613-f2258) with a .748 OPS. His career split against left-handers are impressive. He boasts a .321 (247-for-770) batting average with 52 doubles, four triples, 26 home runs, 124 RBI, with a .373 on-base percentage and an .873 OPS. He credits his recent success with some swing changes he made in Toronto in 2015 while also feeding off of the examples set by Josh Donaldson and Jose Bautista. “Being around them helped,” he said. “I incorporated a leg kick which allowed me to keep the bat in the zone longer. I’m able to hit with power not just to left field but also center and right. Even more enticing for the Mariners is his cost. Valencia is third-year arbitration eligible and is projected to make around just over $5 million this season. Blackburn was with the Mariners organization for a short time. He was acquired along with Vogelbach as part of the trade that sent Mike Montgomery to the Cubs. He made 25 starts and one relief appearance at the Class AA level with the Cubs and Mariners’ affiliates, posting a 9-5 record with a 3.27 ERA.